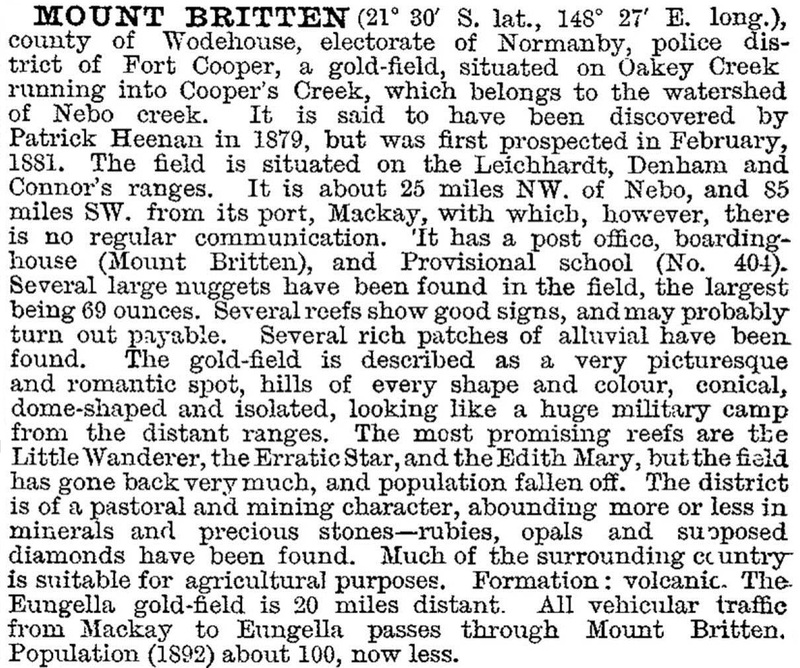 Mount Britton (originally Britten) was a gold-mining town in the Mackay region, 65 km west of Sarina. The topographic mount (727 m) was named by William Landsborough in 1856, apparently after an acquaintance, James Britton. It is a few kilometres west of the former town, which is on Oaky Creek where alluvial gold was discovered in 1881. Within a short time of the discovery there were six hotels in Mount Britton, catering to an estimated 1500 people. There were also several stores, butchers, bakers and a school of arts hall. As former mining towns go, Mount Britton's landscape is relatively undisturbed, and the town has a picturesque setting with the creek and mountain ranges. Remains of buildings and relic garden trees mark the site. The surrounding country is used for grazing.